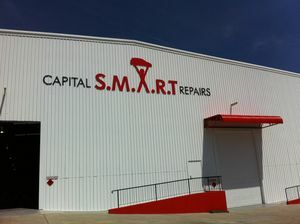 Capital SMART Repairs can be located opposite Gilmore Tiles, on Gilmore Road, which can be accessed from Kings Highway, Canberra Avenue or Lanyon Drive. When dropping off your car please turn left into our first driveway then right into the first roller door and proceed to the dedicated assessment bay at the top of the ramp. Walk in to reception where Customer Care will greet you.